Contrasting examples of our respectful relationship with trees and wood comes from around the globe. In Japan, almost all Shinto shrines are surrounded by a grove of old-growth trees. The blog Green Shinto has several posts that relate to these sacred groves. Even urban shrines will often have a few ancient trees. Some trees are singled out as being sanctified by the presence of kami/spirits. Ropes called shimenawa decorated with white paper streamers called shide often surround the tree to manifest their sacredness. In my travels I have been privileged to encounter many of these trees and the sense of awe they invoke. It is no wonder that trees have inspired artists, writers and musicians over the centuries. 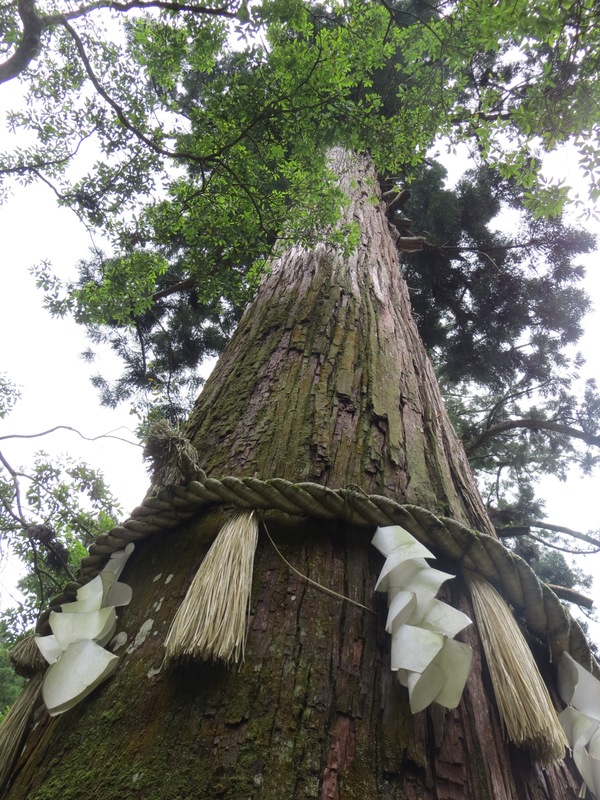 An 800 year old sacred tree with shimenawa (rope) and shide (white paper streamers) at Yuki Shrine, Mt Kurama, NW of Kyoto, Japan. Shinto has long recognized the special quality of trees. It is believed that the Japanese originally worshipped kami in dense groves of tall trees. Later, shrine buildings were constructed to house the deities, but the traditional animistic cosmology was continued using sacred trees and groves. While animist connections have mostly been lost in the west, towering forests such as the Redwoods in the western United States and the eucalypt forests in southern Australia can still provide a sublime experience, likened to being in an outdoor cathedral. 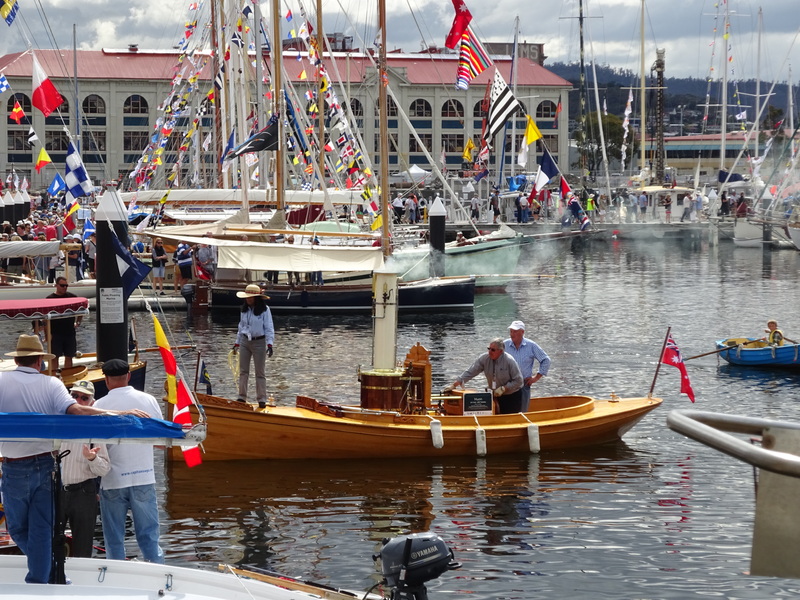 As well as Australia having majestic eucalypts, the tallest flowering plant in the world, every two years the Australian Wooden Boat Festival is organised in Hobart, Tasmania. The most recent event was held last weekend and was a celebration of the use of wood to create beautiful boats, of all shapes and sizes, for transport and pleasure. An International Wooden Boat Symposium associated with the event shows the continued interest in, and reverence for, wood as a material for boat-building. The biennial Australian Wooden Boat Festival demonstrates the continuing reverence for wood as a boat-building material. Most recently held in February 2015 in Hobart, Tasmania, Australia. The Vikings were a sea-faring people who made great use of wooden water-craft for exploration, trade and warfare. Such was the importance of the wooden boats that people of high status were at times buried in mounds with large water-craft. The Viking Boat Museum in Oslo has a particularly striking example from 834 AD called the Oseberg ship – which is 21.58 m long – used in a burial mound for two women of high status. The Viking world was shaped by belief in the central world-tree of Yggdrasil, another link to wood, amongst other gods and a host of nature spirits. The concept of a world-tree, or Tree of Life alludes to the interconnection of all life. It is found in many cultures and philosophies including those in Eurasia, the Americas and Africa. 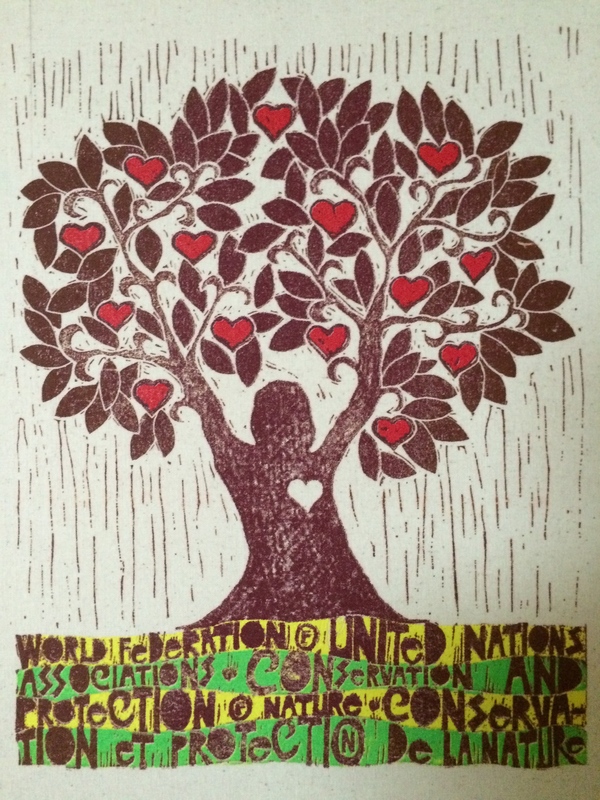 The image is compelling and one that I enjoy in my office, courtesy of the World Federation of United Nations Associations. This UN image of the Tree of Life reminds me of the beauty of trees and the interconnectedness of all things. The worship of trees and wood described so far largely reflects our direct connections to this element, what one can see, touch, smell and feel. Wu Xing is more complex. The Wikipedia entry says not only that the Chinese xing are primarily concerned with process and change – and hence is more accurately translated as phases or agents – it also indicates that Mu, the chinese character commonly translated as wood is thought of as “Tree” in the five phase theory. Despite this, “wood” and “five elements” has become the norm for describing the Chinese philosophy of Wu Xing in the west and its use in systems such as Feng Shui and acupuncture. 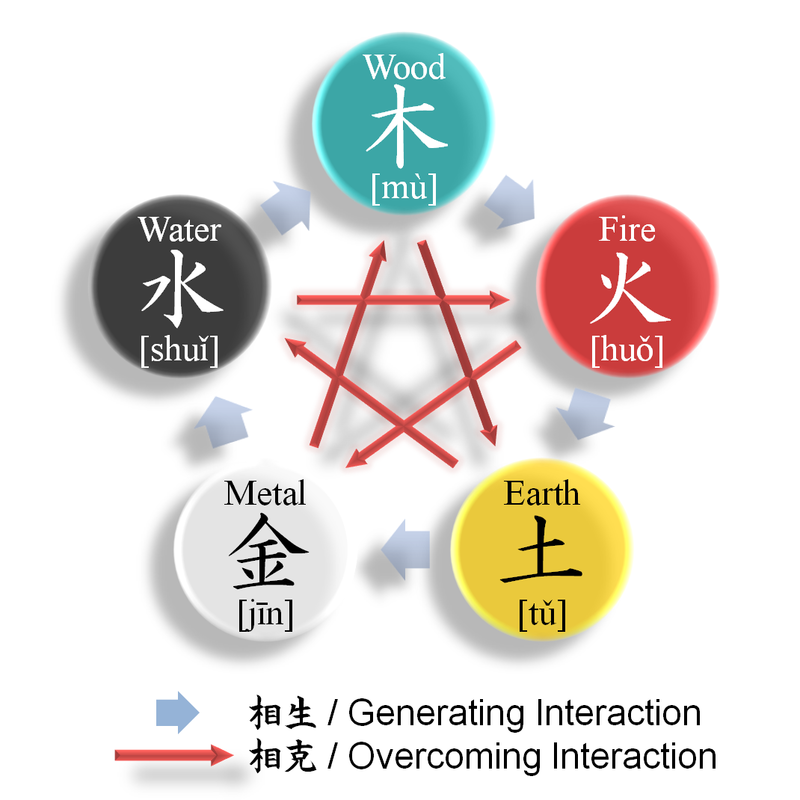 As with all ‘elements’ in Wu Xing, the wood element is associated with an intricate series of connections with different aspects of nature. These include directions, colours, shapes, planets, materials, seasons and climate. Based on a particular directional energy flow from one element/phase to the next, the interaction can be expansive, destructive, or exhaustive. In the generating cycle, wood feeds fire and in the overcoming cycle, wood parts earth such as through the actions of roots. The complex and intriguing nature of Wu Xing will be explored in further posts. The complex and intriguing Wu Xing – five phases – of Chinese philosophy. Source: Wikipedia. There is no denying the importance of trees and wood to human existence, both materially and spiritually. The decimation of forests over the course of human history can therefore be difficult to comprehend, especially as it has been linked to the downfall of some civilisations. Time will tell if our global community will learn the lessons of the past and once again worship trees and wood. This entry was posted in Australia, China, Earth, Europe, Japan, USA, Visual Arts, Wood and tagged Australia, China, earth, Japan, Tree of life, Wood, Wu Xing. Bookmark the permalink. Excellent! A stimulating commentary. Thank you Jann. One of my favourite topics! A thorough and thoughtful commentary on our relationship to trees. It seems the more we learn, the more there is to discover. I look forward to your next instalment.